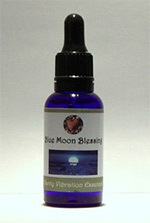 The Blue Moon Blessing Essence has been created by one of the first Moon Mothers. Use daily after the Personal Blessing or after the Worldwide Womb Blessing to help you to ground and integrate the beautiful energies and to bring the Divine Feminine into your life. It is especially supportive for Active Moon Mothers and the spray has the most beautiful scent. I highly recommend it and use it in all my Moon Mother training workshops. This unique handcrafted and beautiful blend of essences was made on the August full moon. Womb Blessing Quartz, Silver Goddess Moonstone and String of Hearts Rosary Vine make up this vibrational essence blend. 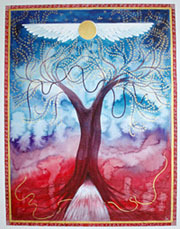 "This beautiful essence, created by an equally beautiful Moon Mother, is supportive and grounding. And it smells divine! Sprayed into the aura, it connect us to the deep and enveloping presence of the Goddess so that we receive Her strength, Her beauty, Her grace and Her love. I offer the Blue Moon Blessing Essence in my workshops to help Moon Mothers after their initiation and I recommend it to all Moon Mothers to help support women who have received a Womb Blessing. The essence is also a wonderful way for us to care for ourselves after the Worldwide Womb Blessing as we integrate the many energy changes. Use it also during your pre-menstrual and menstrual phases to help balance your energies, at the Full Moon to connect to the Moon Goddess, and in those moments when you want to return to your empowerment and sacredness. Clare has created a wonderful essence, thank you so much :o)"
The Blue Moon Blessing Essence is available in two sizes, 30ml or 100ml, and can be bought directly from the Clarity Vibrations web shop.